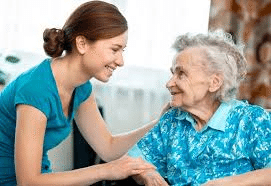 What Type of Elderly Care Facility is Needed For My Parent? When it comes to moving elderly parents or parents and broaching the “nursing home” or “elderly care facility” conversation, it is probably one of the hardest decisions a child will ever have to make. Many seniors unrealistically believe they can take care of themselves for the rest of their lives. This is understandable; home is home and the thought of leaving there is disheartening. This is where children or other family members can be instrumental in initiating change. No matter what the age of your parent, or if it’s you that is moving, experts advise to begin communicating as soon as possible about the future. If you open the lines of communication early on, words like “nursing home” lose their sting later on. Moving a parent into assisted living should be planned well in advance- just in case. The first step in researching assisted living and nursing care facilities is to decide what level of care you or your parent will require. There are no hard and fast rules that state exactly what services a facility must offer to be able to call itself an assisted living facility, so your first step should be to sit down and think about what services will be required. Once you have listed the required care services, you’ll be prepared to look for key information on facility websites, and ask the right questions of their intake representatives. Assisted Living residences, or residential care homes, are aimed at helping residents remain as self-sufficient as possible with the assurance of assistance when needed. A combination of housing, meals, personal care and support, social activities, 24-hour supervision and, in some residences, health-related services are usually provided. Nursing care facilities are designed for patients who require more intensive care than what an Assisted Living facility will require. In general, the difference between Assisted Living and Nursing Care is that in Assisted Living the resident is in his or her own apartment which is equipped with numerous call buttons for contacting nursing staff as needed. In a nursing home the patient is in his or her own room, and care staff are constantly walking the halls and looking in through the doorway to keep an eye on things. Nursing home call buttons are located next to the patient’s bed, in the bathroom, and sometimes on the patient’s wheelchair. Hospice care goes a step beyond nursing care, and is generally for patients who have a terminal illness, whose doctors have advised them that additional treatment is unlikely to be productive. Patients in hospice facilities are frequently bed-ridden, and receive near constant care, sometimes from a nurse that’s assigned solely to them, or a nurse who only has one other patient. Many Assisted Living and Nursing Care facilities are featured on senior living websites that offer pictures of the interior of the facility, and information on the programs and services offered. www.seniorhousingnet.com and www.assistedlivingtoday.net are two directory sites for care facilities. Over the past two decades, increasing attention has been paid to relocation stress syndrome (RSS), also known as transfer trauma. RSS is a diagnosis characterized by a combination of physiologic and psychological disturbances that occur as a result of transferring a person from one environment to another. Symptoms of relocation stress syndrome include exhaustion, sleep disturbances, anxiety, grief and loss, depression and disorientation. In seniors, these symptoms are exacerbated by dementia, mild cognitive impairment, poor physical health, frailty, lack of a support system, and sensory impairment. For these seniors in particular, the resulting confusion, depression and agitation have led to increased falls, undesirable weight loss and self-care deficits. Although initial studies on RSS focused on outcomes of individuals moved to nursing homes and assisted living facilities without their involvement or consent, it is now generally understood that RSS can affect those who have chosen to move, been involuntarily relocated, or been placed in a care facility for mental or medical needs. It is not surprising that seniors do better after a move when they are involved in the decision, have an opportunity to voice their concerns and be heard, and are able to maintain a sense of control. Anyone, regardless of age, would do better under these circumstances. The problem is: seniors often don’t get this opportunity. Well-meaning family members may make decisions on their elderly loved ones’ behalf, not soliciting or listening to their concerns, or simply need to move the seniors faster than they can handle. In short, family members often focus on the details of the move rather than on the person who is moving. Be careful to not condescend or devalue their input. When an elderly parent transitions from their home into assisted living, independent living, or a nursing home, it’s in the same category as getting married or having a baby, but more akin to a loss or a grieving process. Remember to be available when they need your support, start communicating early, and include them in the process.